I’ve partnered with the South West Baseball League to create a tour of Homeward Bound, my show about my son’s love of baseball and my own Northern upbringing. From September it will be touring to all the south west towns and cities who have baseball teams that play in the south west baseball league. 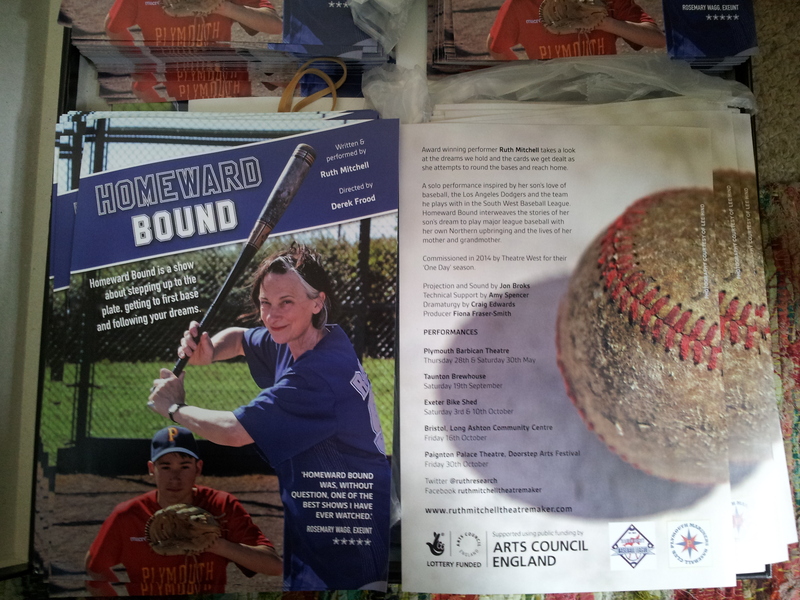 In receipt of a Homeward Bound flyer or programme, audience members have the opportunity to a free training session with their local baseball team. This entry was posted in Festival, Performances and tagged Bike Shed Theatre, Brewhouse Taunton, Bristol Bats & Badgers, Doorstep Arts, Exeter Spitfires, Homeward Bound, Kerry Eggleton, Lee Hind, Long Ashton Community Centre, Plymouth Mariners, Ruth Mitchell, South West Baseball League, Taunton Muskets, Theatre Orchard, Torbay Barons on August 15, 2015 by Ruth.